The second half of the Nicole by OPI Kim Kardashian collection, Wel-Kim To My World, continues to dabble in soft shades, but also has a bit of sparkle available. If you missed the first three polishes in this collection, check out my post here! Nicole by OPI Up & Kim-ing Pink is a soft pale pink creme. This is pastel and very calm looking. 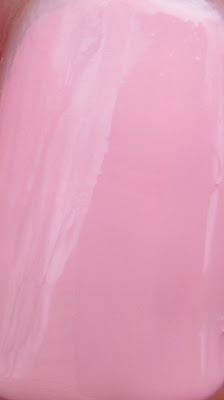 It is a little peachier maybe than some pale pink cremes and looks less blue-based to me. That would make sense, as Kim's skin would look better in a peachier pink than a blue-based one. This is three coats of Up & Kim-ing Pink and it's pretty nicely opaque. The first two coats were a bit streaky, but it all evened out in the end. As with the other pale shades in this collection, I allowed each layer of polish to dry to avoid streaks in the final look. 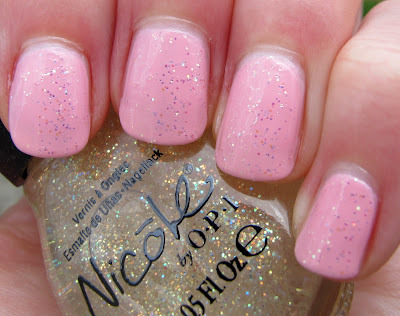 Next up we have the lovely Nicole by OPI Here Kim's The Sun over Up & Kim-ing Pink. Just for the record, the 's is there on the bottle. I am fairly certain this should read "Here Kims The Sun" with no apostrophe. Unless it was called "Here, Kim's The Sun", in which case that is silly because Kim is definitely not the sun. 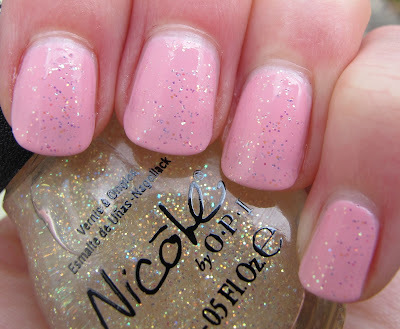 Grammatical errors aside, this is a lovely glitter top coat that can add sparkle to add shade in your polish wardrobe. The glitter is small, but packs a punch with it's iridescence. This reminds me of cupcakes and ponies and stuff like that. 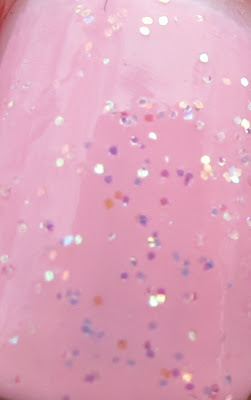 There is definitely a need in every polish collection for a polish that reminds you of cupcakes and ponies. This is two coats. 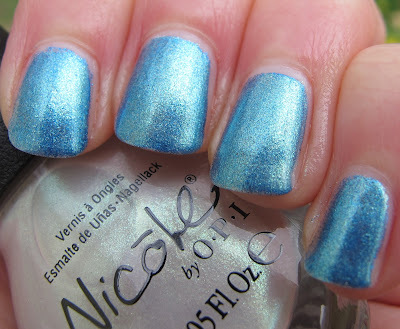 The third polish in this set is an interesting one, Nicole by OPI Lights, Kim-era, Action!. Lights, Kim-era, Action! 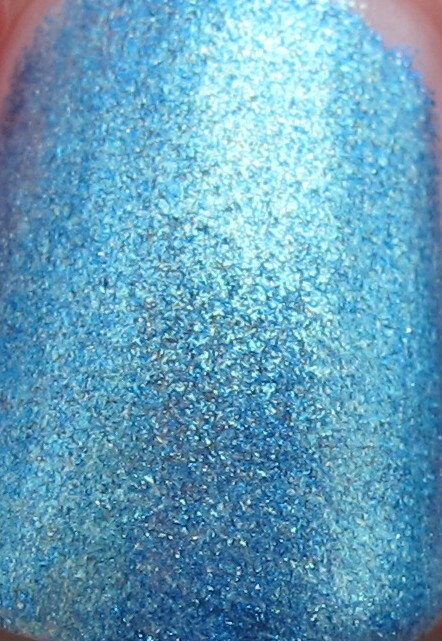 is a sheer duochrome-y white that flashes green, gold, and maybe some pinky/purple. I think this is best used as a top coat to add an extra color flash to another color. I used Nicole by OPI A Lit-Teal Bit of Love for my base here. I think this would look amazing over black or a deep navy blue as well. This is just one coat of Lights, Kim-era, Action! over two coats of A Lit-Teal Bit of Love. I was trying to move my hand around so you could see the subtle green flash this added to the polish, but it was difficult. I really like this for layering purposes though, so you'll probably be seeing it in action again. Overall, the Wel-Kim To My World collection is a soft, soothing type of collection filled with some very wearable shades and two cool toppers. I am not one to wear pale shades very often, but if I were, I'm sure these would make me excited. I do really like the glitter top coat and Lights, Kim-era, Action!. They both could come in handy to refresh a couple day old mani that's getting boring. Wel-Kim to My World will be available April 2012 for $7.99 each at retailers including CVS, Duane Reade, Harmon, Sears, ULTA and Wegmans. In Canada, this line will be available for $10.99 each at Jean Coutu, Loblaw and Shoppers Drug Mart. Favorite quote: "There is definitely a need in every polish collection for a polish that reminds you of cupcakes and ponies." Awesome, and so true. JenMonica- haha, who doesn't love cupcakes and ponies and polish? Lol! A really pretty collection. Definitely at least one colour for everyone!